The apprentice is back for some vengeance. There's not a lot of job security when you're the apprentice to the Dark Lord of the Sith. After the horrible events of the last game, Starkiller's back in Star Wars: The Force Unleashed II to show everyone just how tired he is of being double-crossed by the asthmatic man in black. The trailer shows you just what a badass you can be in this game but it was the live demo that sold me. Starkiller is trying to escape from Vader on Kamino. Things start with Starkiller in a controlled dive down the side of a massive tower. The player gets to destroy all sorts of platforms, TIE Fighters and stormtroopers on the way down, but that's only a prelude to the awesomeness to come. You see, Starkiller has two lightsabers this time around and, as everyone knows, two is better than one. It leads to more combos, more flourishes and, of course, more decapitations. Everything the team learned from the original The Force Unleashed is being carried over into the sequel, and the result is better combat and better pacing overall thanks to small puzzle elements that help break up the action. Sure, all the same Force powers are back, so you can pick up enemies and slam them into nearby generators, and you can crush TIE Fighters with your mind and hurl the wreckage into large groups of enemies, but there are some new tricks Starkiller has learned since we last saw him. His new mind trick ability can not only convince his enemies to fire on each other, but can even convince them that it's in their own best interest to leap to their death from any nearby precipice. There's also a Force Fury mode that amplifies all your Force powers, which can be handy when you want to crush a nearby AT-ST with your mind, or when you want to simultaneously decapitate a dozen stormtroopers at once. Melee combat has been improved as well. You'll now face off against melee opponents who can block your saber attacks, forcing you to think of inventive ways to destroy them. Most impressive of all is the new carbonite trooper, a hulking, armored brute protected by a massive metal shield. To get the best of this enemy, you'll need to wrest the shield from his grasp, at which point you are free to bludgeon him to death with it before scoring one of your awesome finishing moves. The end of the demo saw Starkiller finally make his way to Darth Vader's TIE Fighter, which he stole, leaving no doubt as to how quickly this showdown would escalate. 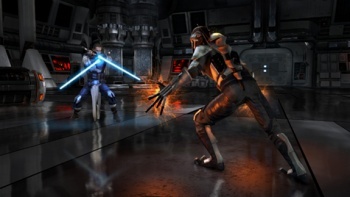 The Force Unleashed II is due out on October 26 of this year.